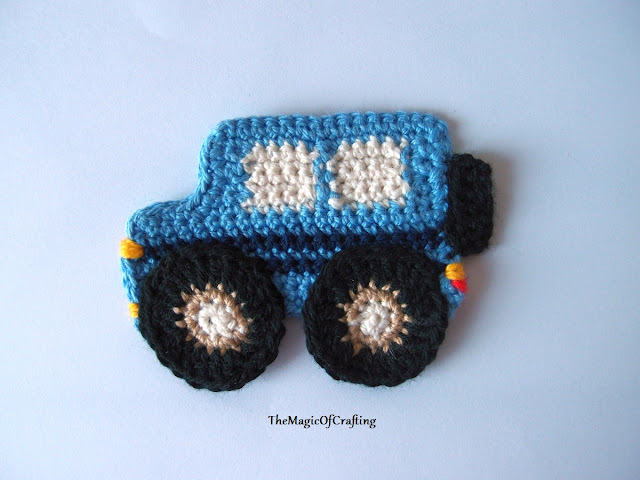 This crochet jeep will make every little boy(or even girl) happy. It is a nice addition to every hat or any toddler garment and takes only a small amount of yarn (if you have scrap yarn left from another project this is where to spend it). Colours used: whatever you want for the jeep body, I have used blue and dark blue. You will also need yellow, red and white for the lights and the windows. Black, beige and white are used for the wheels. Note: You need to know how to change the colours in the middle of the row. It is not really hard - it just need some practice. The general rule is simple - before working the last stitch and when you have only 2 loops on the hook grab the new color with your hook, then pull it through the 2 loops to finish off the stitch. And the colour is now changed to the new one you need. You may also decide to transfer the yarn from the same colour or use few small balls of yarn for each section and crochet with the same yarn ball when you turn the work and make the next row. Row 1: Ch 21, sc in second st from hook, sc in each ch till the end (20 st). Turn. Row 2: Ch 1, sc in the same st, sc in each st till end (20 st). Turn. Row 5: Repeat row 2 with dark blue. Row 6: Repeat row 2 with blue. Row 7: Repeat row 2 with dark blue. Row 8 and 9: Repeat row 2 with blue. Now the top part of the jeep. You will need here 2 small balls of white (or just transfer the white) and 3 blue (or again just transfer the blue). Do not cut the yarn between the different sections of white and blue but leave it free, make sure you don't twist it. Row 10: Ch 1, sc in same st, sc in next st, join white and work sc in the next 5 st, just before finishing the last of the 5 sc grab blue yarn and pull it through the last 2 loops of the 5th sc. Make one sc with blue then work sc with white in the next 5 st. Join blue and make 3 more sc with blue. Turn. Row 11: Now you need to do the same but on the opposite side - start with blue sc in the first 3 st, then 5 sc with white, 1 sc with blue, 5 sc with white and finish with 2 sc in blue. Turn. Row 12 and 14: Repeat row 10. Row 13 and 15: Repeat row 11. Row 16, 17 and 18: With blue ch 1, sc in the same st, sc in each st till end. Turn. Make a row of sc with blue all around the jeep body. Round 3: Join black. Ch 1, sc in the same st, *1 sc in the next st, 2 sc in the next st*. Repeat * - * till the end of the round, end with ss (24 st). Round 4: Ch 1, sc in the same st, * 1 sc, 1 sc, 2 sc in the next st*. Repeat * - * till the end of the round, end with ss (32 st). Make one more wheel and sew them on the jeep. Ch 8, sc in the second st from hook, sc till end. Turn. Ch 1, sc in the same st, sc till end. Cut the yarn and weave in the ends. Sew the wheel on the "back" of the jeep.